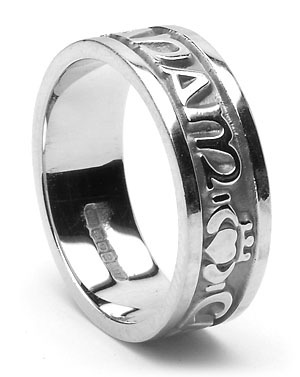 ID211 Anam Cara - Mens,This ring says “My soul mate“ in gaelic, as well as incorporating the Claddagh symbol. 10ct Yellow gold. This ring says “My soul mate“ in gaelic, as well as incorporating the Claddagh symbol. 10ct Yellow gold. This beautiful ring is unique, in that it says “Mo anam cara” on it, which means “My soul mate” in Gaelic, while also incorporating the Claddagh symbol, which means “Love, Loyalty and friendship”. This ring is made to order in your size. Please allow 4-6 weeks delivery. 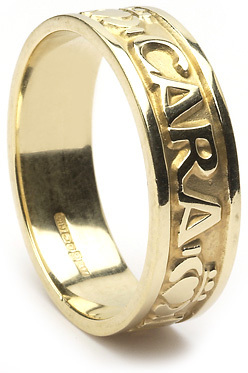 ID211 Anam Cara - Ladies,This ring says “My soul mate“ in gaelic, as well as incorporating the Claddagh symbol. 10ct Yellow gold. ID333 - Everlasting, This stunning new engagement rings has celtic knotwork which symbolizes two forces moving in harmony for eternity. ID312 Celtic Knot - Ladies,This claddagh is a heavy weight "Puffed heart" version of the ring. ID213 NEW LOVERS KNOT BAND GENTS,Stunning new ring to our range with the lovers knot.